Not only does your hardscape or paver patio add functionality to your outdoor living space, it’s a worthwhile investment that should be protected. One of the biggest benefits of today’s paver and stone products is that they don’t require a great deal of work to maintain. Follow these six steps to keep your outdoor hardscape beautiful and inviting. 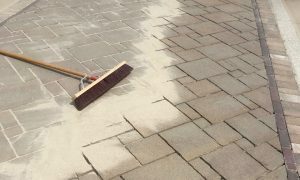 Once your hardscape has been installed, consider using a sealer for additional color enhancement and stain protection. When selecting a sealer, keep in mind that a high gloss finish will bring out the paver color while a matte finish primarily serves to protect your pavers and reduce maintenance. While our Unilock paver products have long lasting, maintenance-free surfaces that don’t require sealing, many homeowners choose to add a sealer for additional protection. Sweep your hardscape surfaces often to keep them free of leaves and debris. You may have to sweep more frequently during the autumn months when leaves and other yard waste can decompose on the surface, resulting in mold or stains. Use your garden hose to wash off any remaining debris that may be stuck on the pavers or stones. Check hardscape surfaces for stains. If there are no serious stains to address, a good pressure wash should remove any surface stains. If you don’t have a pressure washer, you can try cleaning the area with a stiff bristle broom and a small amount of dish detergent diluted with water. Another option is Unilock’s Hardscape Cleaner. Just remember, with any hardscape cleaner you use, always read the instructions first. Check for loose polymeric jointing sand. Prevent additional erosion and weed growth by checking for loose sand between your paver joints. If you find loose sand, you may need to re-sand the joints and add a sealant to aid in bonding the polymeric jointing sand granules together. If you decide to use a sealer, be sure to distribute the product well into the joints. Look for areas where the joints between your pavers or stones may be increasing in size. This situation is often referred to as “creep.” Creep is generally caused by failure of the edge restraint, environmental stress during the winter months, and heavy traffic that may cause stones or pavers to push out. If this situation is not addressed, it can lead to additional deformities in your hardscape. Pull out any weeds that are emerging through cracks between the tiles. Be sure to remove not just the weed itself, but the roots as well in order to prevent regrowth. If the weeds are difficult to reach, you can use a screwdriver or nail to help get down into the joints and remove the roots. If your busy schedule doesn’t allow you to maintain or clean your outdoor hardscape as often as you would like, contact Landscape Creations to set up a consultation. We can help you determine which type of hardscape would be the best fit for your lifestyle. Recently, my fiance and I moved into our new home and have decided to add hardscaping to our yard. We appreciate your tip to look for spaces where the stones are moving farther apart as a sign of failure in edge restraint. Once we get it done these tips will help us a lot. Thanks for the tips for maintaining a hardscape! I am going to have some decorative rock put in for my porch, and I want to make sure I can take proper care of it. I appreciate you mentioning to make sure you pull out weeds that are coming up in the cracks. It makes sense that you would want them gone as soon as possible to keep the rest of the yard in good shape. I will keep this in mind. Of the tips that you gave, what I liked the most was your suggestion of cleaning the hardscaping with through power washing every once in a while or clean it with a bristled broom and dish detergent. I am aware that keeping it clean is one way to ensure that the hardscaping lasts a long time. I will surely mention this to my parents as they plan on getting the hardscaping done in the front and backyard next month. Thanks!